The Scholastic Summer Reading Road Trip RV will be stopping at Fundamentals in downtown Delaware from 2 to 4 p.m. on Sunday, July 22. 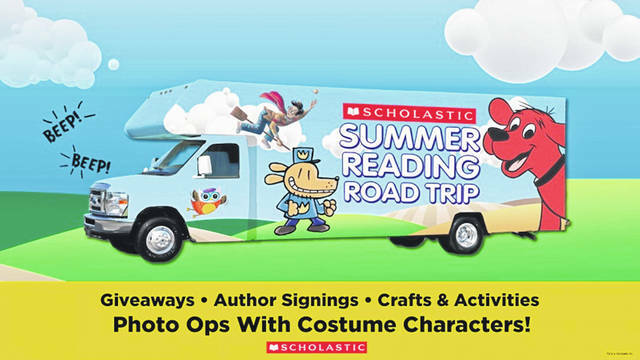 This Sunday, the Scholastic Summer Reading Road Trip RV will make a stop at Fundamentals Children’s Books, Toys, & Games in downtown Delaware. According to Fundamentals, throughout July, two Scholastic RVs have been making stops at bookstores, libraries, and community organizations around the country and will be stopping at Fundamentals on Sunday afternoon. Fundamentals reports that from 2 to 4 p.m., West Winter Street from the Bun’s parking lot to Franklin Street will be the scene of games, prizes, giveaways, and costumed characters including Clifford the Big Red Dog, Dog Man and Geronimo Stilton. Furlong said last year’s Reading Road Trip was very successful and had a big turn out. Furlong said Fundamentals is one of the few repeat store visits on the road trip, and she added the business feels “very honored” to be chosen again. More information about the event can be found at http://oomscholasticblog.com/post/buckle-summer-reading-road-trip.